Notes: This is an active graveyard is well , maintained any visitors should show respect when entering. High atop sand hill road is a place the locals have much lore about. 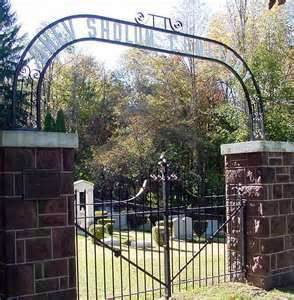 The place is referred to commonly in the area as the old Jewish Cemetery. Many people have had experiences there, commonly reporting moans and screams when German is spoken. back to the cemetery and one of the guys starts speaking something in German. There's this loud scream and this black figure chased us out of the cemetery. Trust me, you don't want to go up there after dark." We at NightWatch Paranormal usually stay away from graveyards as there is no real need to bother those looking for eternal rest. We heard a lot of tales when speaking about the Paranormal in the area. However, we ran into a client who had gone there to catch some pictures of paranormal activity. They engaged in some provoking which included playing some “Nazi music” and yelling stuff in German. There was an apparent reaction from the occupants of the graveyard and the amateur ghost hunters left in a hurry. They started having extreme activity at their house shortly afterwards. We are still working this case at the time of this writing in January of 2013. If we can get permission we may do an investigation of this site. Not our usual type of event, but we seek to assist our clients. We will keep our readers posted.